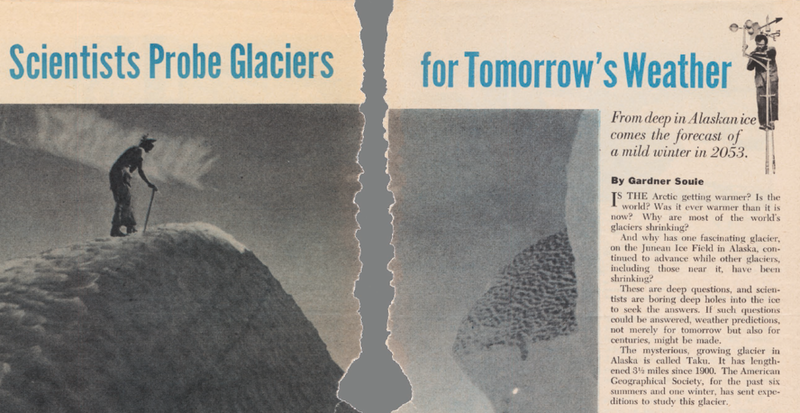 Recent communication between George Argus (JIRP '52) and JIRP surveyor Scott McGee (JIRP '88) has brought to light a short piece on JIRP in Popular Science - "Scientists Probe Glaciers for Tomorrow's Weather" - from November 1953. Most enlightening, perhaps, are the aspects of JIRP that have not changed in the 60+ years since this article was published. As we prepare for JIRP 2016, it is these commonalities that are striking. 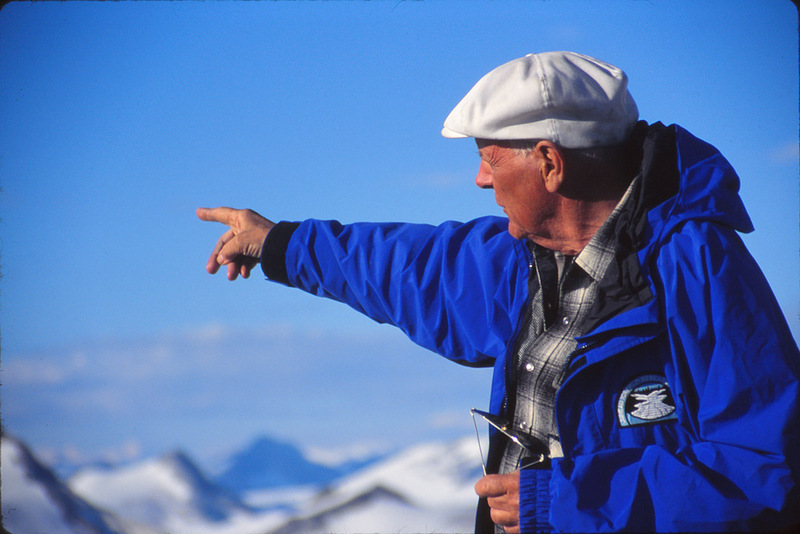 Dr. Calvin Heusser was one of the on-ice leaders in the early 1950s, and his quotes on botany, ecology, glacier surface color and the riddle of the advancing Taku Glaicer resonate and continue as areas of study today. And with humanity continuing to grapple with the challenges of climate change, it's with more than a bit of awe to read about some of the early understanding and indeed forecasts of a warming Earth. Look forward to announcements of JIRP 2016 details in the coming weeks, including core research areas, participating faculty and the fantastic group of students we look forward to welcoming to the JIRP family in 2016. "It makes you feel all's right with the world, and is a big reason you go up there aside from the scientific purposes." Access the November 1953 Popular Science article here. Dr. Maynard Miller, the beloved founder and long-time director of JIRP, passed away January 26th at his home in Moscow, Idaho. In the coming days and weeks we will be adding more images, stories, videos, and history of his phenomenal life. Eventually this content will be stored permanently on a dedicated page of the JIRP website. Until then, however, we will be adding content here on the JIRP blog. One intention for this is so that you can share a remembrance of Mal; please do so in the comments below and help us honor and memorialize Dr. Miller. If you would like to contribute images, stories, or videos in Mal's remembrance please be in touch with FGER Vice President Matt Beedle by email (beedlem@unbc.ca). Dr. Maynard Miller on the Juneau Icefield. Photo courtesy of the Miller family. Dr. Maynard Malcolm Miller on a Juneau Icefield Expedition in November, 1953. Photo by Ira Spring. Maynard Malcolm Miller, explorer, committed educator and noted scientist whose glaciological research was among the first to identify hard evidence of global climate change as a result of human industrial activity, died on January 26 at his home in Moscow, Idaho. He was 93. Dr. Miller was Emeritus Professor at the University of Idaho where he previously served as Dean of the College of Mines and Earth Resources, and Director of the Glaciological and Arctic Sciences Institute. The Institute, along with the Juneau Icefield Research Program, founded in 1946 and developed in partnership with his late wife Joan Walsh Miller, inspired more than 4000 students through hands on involvement in scientific research in remote mountain environments in Alaska and around the world. As a scientist and climber on America’s first Mt. Everest Expedition in 1963, Miller conducted research on atmospheric pollution and other contributors to climate change. On that historic expedition, as the West Ridge climbers returned from the summit, Miller sacrificed his precious scientific water samples, laboriously collected from the Khumbu Icefall, in order to rehydrate the exhausted climbers. Although a deeply spiritual person, Maynard Miller did not believe in any God of organized religion; instead, he found inspiration in the magnificence and wonder of nature. He also believed that through the challenge of rugged mountain expeditions, where teamwork is essential to achieve a common goal, the best in each individual may be revealed. His great joy was to share and provide these experiences for others. A native of the Northwest, Miller graduated from Stadium High School in Tacoma, Washington. He studied geology and glaciology, receiving degrees from Harvard University and Columbia University, and his PhD from Cambridge University, England. During WWII Miller served on a Navy destroyer, seeing active duty in 11 major Pacific campaigns and sustaining injuries during an aircraft attack at sea. Late in life, Miller served three terms in the Idaho State House of Representatives where he advocated for expanding educational opportunities. He will be remembered for his enthusiasm, unrelenting optimism and phrases such as, “stress helps you grow” and his closing on mountain radio transmissions, “mighty fine, mighty fine”. Miller is survived by his sons and their spouses, Ross Miller (Denise), and Lance Miller (Jana). Miller also leaves behind his beloved grandchildren, Logan, Anna, Zachary and Eva, extended family in the Puget Sound area as well as scores of grateful students, scientific collaborators and co-adventurers. Celebrations of the life of Maynard Malcolm Miller will be announced at a future date. For a limited time only (while supplies last) you can purchase a copy of a revised, spiral-bound 2nd edition of the 2011 Memories of Maynard M. Miller and Other Juneau Icefield Lore. Total cost, including shipping and handling, is $35. All proceeds go directly to JIRP. Thank you to KTOO's Matter Miller (@KTOOMatt) for this content. "Some years ago, after the JIRP presentation and all the students had departed Atlin, Mal dropped in at my place for a chat and to share some nice red wine he had with him. Naturally we discussed the state of the world, and JIRP and other programs. As we came to relaxed and much more cheerful final comments, he said to me 'You know, it's kids like this that give me hope for the future. They really care, and they worked so well together (contented sigh).' Thanks, Mal!" Select any of the photos below to open a slideshow of all the images. For over fifty years Joan was devoted to the success of the Icefield program. Each year, for decades, Joan made the trek to Juneau and on to Atlin to take the helm of the logistics and business administration that steers a successful JIRP field expedition. Joan’s efforts extended beyond the summer program to off season fundraising, proposal writing, reports, reunion organization, newsletter preparation, writing reference letters for students, and more. Joan took much pride in her JIRP efforts as they lead to the direct support of more than 1,500 students and some 400 associated faculty and staff during her decades of involvement. It is beyond doubt that without Joan’s many years of devoted support our JIRP experiences would not have been. In memory of Joan, her phenomenal dedication to JIRP and particularly to JIRP students, we are excited to announce the Joan W. Miller JIRP Scholarship Fund. Donations will be used to help cover tuition costs of selected participants so that the JIRP experience can be accessible to all prospective students. Please make checks payable to FGER, and note that your donation is for the JWM JIRP Scholarship Fund. As with the M3 JIRP Legacy Fund we would like to offer you the opportunity to send a personal note to the Miller family along with your donation. You may include your personal message in the PayPal checkout process or with your donation via the FGER mailing address. Your contribution to the Joan W. Miller JIRP Scholarship Fund helps to preserve Joan’s phenomenal legacy and to support future JIRP students in her name. Thank you for your ongoing support of the Juneau Icefield Research Program. When I headed to Juneau I did not know where I would be living. I assumed it would not be in tents for most of the time. I had everything on the packing list and I knew I was physically and emotionally capable. All that had propelled me into JIRP was curiosity. I was curious about myself and who I would be when surrounded by white. Another thing I did not know, was how many years of great people before me have been curious about themselves in the same way. The legacy of JIRP was completely unknown to me. Back in January my dad told me about how a close family friend of ours had done this thing on the Juneau Icefield where he stayed on the ice for two months and helped students with research. I decided I wanted to go almost immediately after our phone conversation. I was accepted, but our friend died a bit after, so I hardly heard about it from him. Upon entering the world of JIRP on the van from the airport I got my first glimpse into the legacy when I was told that the founder and long-term director of JIRP lives in my hometown (Moscow, Idaho). I knew nothing about Maynard M. Miller at the time, just as I knew nothing about the spirit of what I was getting myself into. A couple of days later, while we were in lecture in Juneau, Dr. Alf Pinchak comes in looking like someone out of another era, and he listened to the lecture with us. Simply seeing him filled me with this strange sense of awe. I was thrilled to learn that he would be coming with us to the Icefield. I started to get little hints of what I was a part of. These camps we were living in were built in the 40’s, largely through military funding and have been in use since then. The first part I saw of Camp 17 were stone structures that had been built for a temporary shelter while these men built the formal camp. In the C17 cook shack, the first JIRP building I entered, the walls were covered in Sharpie writing going back to the 70’s. I did not quite know how to take it all in. Every building is covered in writing. Some of it is really funny. Reading the walls is a common past time. Sometimes I search for names I recognize. To know you are staying in a place where past JIRPers have also been tired, had cabin fever, waited anxiously for mail, and made games out of nothing, brings that place to life. Right before I left Camp 17, I signed by my bed, 15 years before someone from the town where I go to school also slept. I commented enthusiastically in Sharpie on the coincidence and dated it. There was also writing above the staircase where I slept, to be careful not to slip as the author had done (and I almost did many times during my stay). At Camp 10, signatures in the girl’s cabin ranged all the way back to the 60’s. These past inhabitants wrote some funny stuff. They also wrote some dumb stuff. We wrote some responses to these things. There was writing about being tired and sore after the very same traverse we had just completed. The very same older man I talked about seeing in Juneau at the lecture signed my bed in 1963. As did one of this year's safety staff members, in 2011. All these things on top of one another slowly made me feel like maybe I was also a part of the legacy. I will not forget when I came to Camp 9, a tiny shack, where a small group of JIRPers stayed for two nights to dig Mass Balance pits, and I saw the name of the man from my hometown who told me to come here. He scrawled it inconspicuously on the ladder. I had found him. I signed beside it and felt I belonged. Miller, who seems like a legend of a man to me, has been written about everywhere. In the cook shack the words “Miller Rocks” are scrawled messily up high on the wall. There is a tiny loft in the girls’ cabin where the words “FIRE ESCAPE/M3 (meaning Maynard M. Miller) AVOIDANCE DEVICE” are written. Apparently he did not like going in there since he would hit his head on the ceiling. I hear he would often say “Mighty fine, Mighty fine.” These words are written all over the buildings. With their initial steps along Lemon Creek Trail today, Juneau Icefield Research Program (JIRP) participants marked the beginning of an annual expedition to the Juneau Icefield. This hallowed academic expedition has roots reaching back to 1948, and a history of visioning and reconnaissance beginning in the early 1940s. In August and September of 1941, a team that included William O. Field, Jr. and Maynard M. Miller (amongst others) studied the glacier termini of Glacier Bay and the inlets and fjords near Juneau (Field, 1942). Field and Miller would later recall that it was during this expedition of the 1940s that it began to become apparent that it was necessary to study the upper reaches of these Alaska glaciers to understand their disparate behavior (Field and Miller, 1950). JIRP work on the icefield began in the summer of 1948 with a reconnaissance party tasked with searching for routes to access the accumulation area of the Juneau Icefield, and to begin to determine the gear and logistics necessary to carry out thorough investigations. Over the course of three weeks a team of six carried out this early reconnaissance and also initiated glaciological, geological, botanical and meteorological studies. Following the early, more exploratory years of JIRP in the late-1940s, extensive field research in the 1950s was lead by a host of collaborators, including Calvin Heusser, Art Gilkey, Ed LaChappelle, and Larry Nielson along with Field and Miller. These early years of JIRP are brilliantly chronicled in a recent retrospective by Calvin Heusser, complete with wonderful journal entries from the early expeditions on the Juneau Icefield (Heusser, 2007). In the late-1950s and early-1960s JIRP the 'Project' became JIRP the 'Program'. This transition, and subsequent half-century of JIRP, was lead by the team of Maynard and Joan Miller. And while it was Maynard and Joan who were the driving force behind JIRP for many decades, I would be remiss if I did not mention the efforts of hundreds of devoted volunteers and financial supporters that have brought to fruition this experience for further generations. And today, 65 years after the first reconnaissance team of six, JIRP continues as an unrivaled academic expedition. Over the next seven weeks, across the Juneau Icefield from Juneau, AK to Atlin, BC, 25 new JIRPers will join the storied history of JIRP. From the Vertical Swamp to the Vaughan Lewis, the Lemon Creek to the Llewellyn, Split Thumb to Storm Range, this country, this experience never ceases to inspire. Be inspired, JIRPers of 2013! Field, W. O. 1942. Glacier Studies in Alaska, 1941, Geographical Review , 31, 1, 154-155. Field, W. O. 2004. With a Camera in my Hands: William O. Field, Pioneer Glaciologist: A Life History as Told to C. Suzanne Brown, University of Alaska Press, Fairbanks, 184 pp. Field, W. O. and Miller, M. M. 1950. The Juneau Ice Field Research Project, Geographical Review , 40, 2, 179-190. Heusser, C. J. 2007. Juneau Icefield Research Project (1949-1958): A Retrospective, Developments in Quaternary Sciences, 8, 232 pp. Russell, I. C. 1897. Glaciers of North America, Ginn and Co., Boston, 220 pp.